LOS ANGELES - Randy Orton cashed in his Money in the Bank contract to defeat Daniel Bryan and become the new WWE Champion after a shocking betrayal from Triple H.
﻿﻿﻿﻿Bray Wyatt stepped into Kane's Ring of Fire to open the main card at SummerSlam. But would the flames achieve their purpose of keeping the Wyatt Family out? Erick Rowan and Luke Harper finally found a way to beat the flames, using a fire retardant blanket to get over the flames. They entered the ring and attacked Kane, the numbers game caught up and Kane was finished by Bray Wyatt, and he picked up a huge victory on his debut. But, the Wyatt Family were not done yet. The Wyatt Family savagely attacked Kane with the steel steps, smashing his head of the steps, before they left the arena... with Kane. ﻿﻿﻿﻿﻿Really strong way to start of the PPV, it is awesome to see the ring surrounded in fire. Some people were complaining about the flame height, I think that it did not really matter as the flames went up during big moves or attempts to get in the ring. I expected Bray Wyatt to win clean, and I was pretty shocked when the Wyatt's used the blanket to get through. But, this opens up for much more now, and there is a lot of intrigue ahead of what the Wyatts will actually do with Kane. 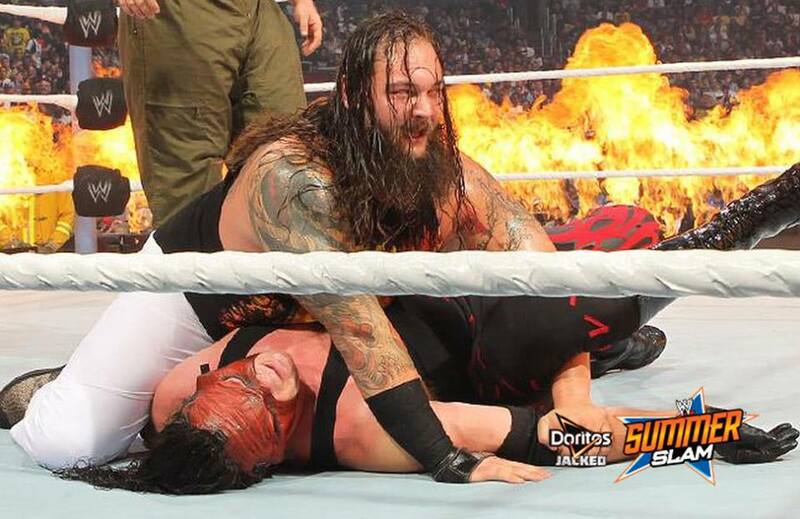 Bray Wyatt debuts on winning ways after defeating Kane in a Ring of Fire. But the Wyatt Family have taken Kane, where is he going, and what are the intentions of the Wyatt Family? ﻿﻿﻿﻿﻿﻿﻿﻿ Mr. Money in the Bank Cody Rhodes took to the ring to battle his former friend Cody Rhodes in a match that began the next chapter in their personal rivalry. As expected, there was some superb in-ring wrestling by the two. It was clear of how well they knew each other in the ring with numerous counters and familiarity. After a great showcase of the WWE's finest mid-carders, Cody Rhodes struck out of nowhere with a Disaster Kick, ultimately finished off with Cross-Rhodes to pin the Intellectual Savior of the Masses, Damien Sandow. Superb wrestling between the two. It is speculative to say the least that they may have deserved more time but they made great work with the time they had. This rivalry may not be over considering that Cody Rhodes won and he may pursue the briefcase, or this rivalry may be reincarnated further down the line if/when Damien Sandow is World Heavyweight Champion. Christian got "One More Match" when he had a Golden opportunity at the World Heavyweight Championship as he challenged Alberto Del Rio. A very technical contest proved for some great entertainment, with Christian pulling out all the stops in his opportunity to finally capture the World Heavyweight Championship again. It was another awesome contest, with the fans showing their appreciation chanting "THIS IS AWESOME!" and they just seemed lively throughout the bout. After a fair share of close calls, Christian took a lot of punishment but almost had it secured when he hit a Spear, but he injured his arm in the process, allowing Alberto Del Rio to lock in a lethal Cross-Arm Breaker. Following a resilient struggle from Christian in resistance to the submission, it was ulimately an effort in vein as Christian tapped out. Another great match. Strong start to the match with three enthralling bouts. Maybe the questionable booking of these two in a non-title match a few weeks ago can be justified timidly, as this match was awesome. I did not expect Christian to tap out, I expected Del Rio to be screwed by Christian. Maybe they may have another bout, because Christian deserves a World title, and Alberto Del Rio is getting stale as Champion. Still produced an excellent match, though. Christian is forced to tap out. Alberto Del Rio remains World Heavyweight Champion. Could this be the end of Christian? Or does he need One More Match? Total Divas stars Natalya and Brie Bella went one-on-one with the rest of the cast in support looking on ringside. A short match that really was just a prolonged advert for Total Divas, the expected chaos breaks out to show you the drama... blah, blah, blah. The Best vs. The Beast. It was No Disqualification as Brock Lesnar and CM Punk went to war in Los Angeles. It was fast paced and physical straight from the bell, with Brock Lesnar manhandling CM Punk in the early stages. CM Punk looked in dire straits during the match and it could have been all over within minutes. When CM Punk found an opening, he exploited it, but then his attention turned to Paul Heyman, and it cost him. Brock Lesnar was able to attack CM Punk and regain control, throwing him around like a ragdoll, on the commentary table and he even nailed a perfect belly-to-belly suplex. Brock Lesnar was dominant, but CM Punk's determination helped him get through it and take an advantage. CM Punk finally got his hands on Heyman. There was an incredible sequence of submissions when CM Punk found himself in a Kimura, but then he managed to keep on a tight Triangle Choke, and it took two powerbombs for Brock to break out. 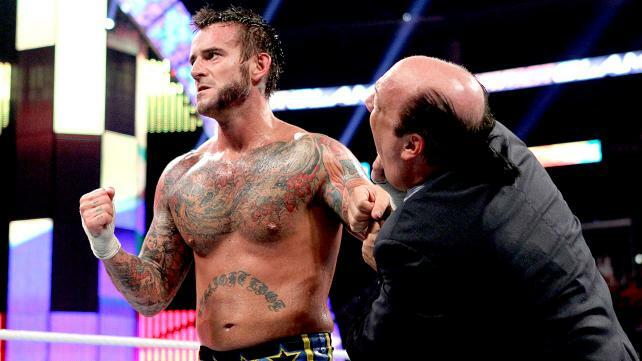 Eventually, CM Punk would once again regain control, but yet again, his attention to Paul Heyman would be his downfall. 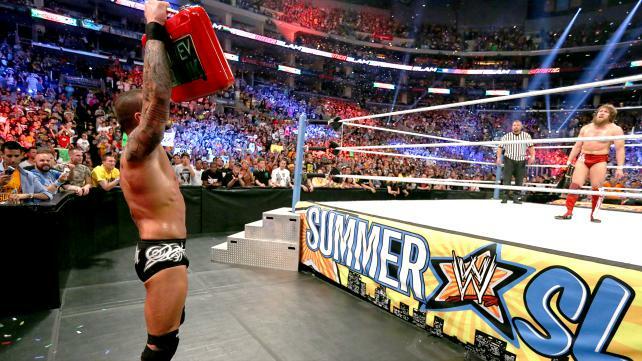 CM Punk was able to gain an advantage when Paul Heyman was on the apron. He grabbed on to his tie when Brock Lesnar was preparing to finish it off with an F5, and he hit CM Punk with a GTS. But instead of going for the pinfall, he once again pursued Heyman, but this allowed Lesnar to recover and eventually finish it with an F5 on the steel chair. Chaotic? Hard to digest? You bet. And the thing is, that is just some of what happened in the incredible battle. Include an Anaconda Vise to Heyman, a few steel chairs and a lot more then you'll be there. INCREDIBLE match. Undoubtedly a Match of the Year candidate. Completely worth the money on pay-per-view, props to both for putting on outstanding performances. The hardest thing is actually writing about this match, because there is so much to write about. This stole the show. Reading about it is not good enough, you need to watch it to realize just how amazing it was. Brock Lesnar and CM Punk, thank you for putting on a phenomenal match. Two rivalries intertwined drew to a standstill in Mixed Tag Team action as Big E Langston and AJ Lee teamed to face Dolph Ziggler and Kaitlyn. After some back-and-forth rivalry settling (sometimes generic) in ring action, Big E Langston almost capitalized on Dolph Ziggler who was distracted by AJ Lee, but Ziggler managed to kick out and eventually finish Langston, marking a double victory for Ziggler and Kaitlyn. The WWE Championship showdown would close the show, as Daniel Bryan challenged John Cena for the most coveted prize in sports entertainment, with Triple H overseeing the action as referee. Special Guest Referee, the King of Kings, Triple H vowes to be impartial. John Cena had to bring a much more technical game when he stepped in the ring with Daniel Bryan. Daniel Bryan was bringing his A-Game to the table and had Cena in a bad way with his numerous technical moves. Cena was a recipient of BOOS and negative reception, while the crowd were fully fledged behind Daniel Bryan. Bryan continued to wear out John Cena, and it could have been all over with a Guillotine choke (that Chael Sonnen used to submit Shogun Rua) but John Cena just managed to escape. After an incredible and physical contest, the two were exhausted and found themselves slapping each other, and it escalated into Daniel Bryan taking control with Los Angeles embracing the YES! YES! YES! Then he did it, Daniel Bryan ran from the turnbuckle and knocked out John Cena, pinning him for the win, and the new WWE Champion is crowned! But then... Randy Orton's music hit. Would he cash in? It seemed like he was just sending a message. Then Triple H turned to Daniel Bryan delivering a huge Pedigree, allowing Randy Orton to cash-in and become the New WWE Champion. The Viper advances his way to the ring, as the WWE Universe goes crazy. Triple H betrays Daniel Bryan hitting him with a Pedigree. Another AMAZING match! Incredible way to end SummerSlam, I thought that Bryan would not win clean, but in fact he did! What a way to end with a New Champion! Then Triple H turns on Bryan! What an end to SummerSlam. 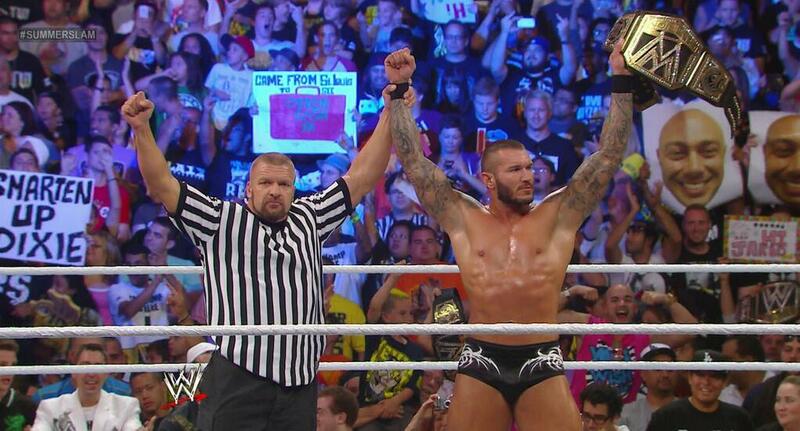 New WWE Champion, Randy Orton. SummerSlam indeed lives up to expectations and exceeds it! INCREDIBLE EVENT WITH AN AMAZING ENDING! WOW. Completely worth the buy! The only matches that really lacked something were the Mixed Tag Match and Diva's match. Christian vs. Del Rio was an excellent contest, Sandow and Rhodes put on some great action, and we had two EPIC MATCHES FOR THE AGES with Lesnar vs. Punk and Bryan vs. Cena. I personally cannot wait for what is next. Randy Orton and Triple H are now heel, and the landscape of the WWE has been turned upside down. SummerSlam is one of the best Pay-Per-Views I have seen in the last few years. If you have not watched it, you need to - it is just... WOW. Best match of the night? Lesnar vs. Punk edges it SLIGHTLY over Bryan vs. Cena - but both were phenomenal. The WWE has hit it out of the park with SummerSlam, many are going to be tuning into RAW to see what happens next. Woah! What a night. Shocking end to an incredible night. WWE SummerSlam lives up to it's title of the Biggest Event of the Summer with an incredible night of action. The door is wide open in prosperity for the future after this event. We have a new WWE Champion, The Beast has beaten the Best and much more. The New Era has begun. Full coverage, media, analysis, review and more for WWE SummerSlam 2013 including Brock Lesnar vs. CM Punk, John Cena vs. Daniel Bryan and much more wrestling action.